The product of six years of collaborative research, this fine biography offers new interpretations of a pioneering figure in anesthesiology, epidemiology, medical cartography, and public health. It modifies the conventional rags to riches portrait of John Snow by synthesizing fresh information about his early life from archival research and recent studies. It explores the intellectual roots of his commitments to vegetarianism, temperance, and pure drinking water, first developed when he was a medical apprentice and assistant in the north of England. 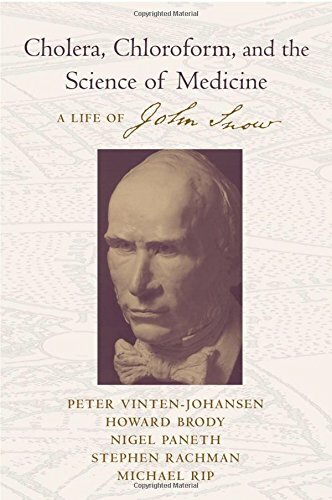 The authors argue that all of Snow's later contributions are traceable to the medical paradigm he imbibed as a medical student in London and put into practice early in his career as a clinician: that medicine as a science required the incorporation of recent developments in its collateral sciences--chiefly anatomy, chemistry, and physiology--in order to understand the causes of disease. Snow's theoretical breakthroughs in anesthesia were extensions of his experimental research in respiratory physiology and the properties of inhaled gases. Shortly thereafter, his understanding of gas laws led him to reject miasmatic explanations for the spread of cholera, and to develop an alternative theory in consonance with what was then known about chemistry and the physiology of digestion. Using all of Snow's writings, the authors follow him when working in his home laboratory, visiting patients throughout London, attending medical society meetings, and conducting studies during the cholera epidemics of 1849 and 1854. The result is a book that demythologizes some overly heroic views of Snow by providing a fairer measure of his actual contributions. It will have an impact not only on the understanding of the man but also on the history of epidemiology and medical science.